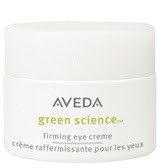 Aveda Green ScienceTM Firming Eye Creme is intended to moisturize, smooth fine lines and reduce the appearance of puffiness and dark circles. I've recently noticed that my soon to be 25-year old face, specificially my under eyes, do not bounce back quite as quickly as they did in college after a long weekend out. So, I hit the internet in search of a product that could potentially help me with my dark circles. 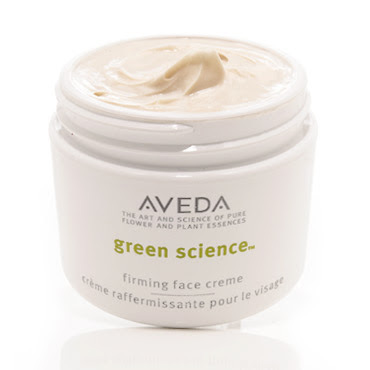 I found the Aveda Green Science line which includes four products and is intended to mosturize, replenish, fill, buff, and tighten the skin. Although I'm sure I'm not the typical demographic to be using this line, I have always had dark circles under my eyes and just recently I've noticed that before I looked tired and now I'm starting to look sick and old. (I'm sure if you asked anyone close to me they would say that it sounds worse than it really is, but don't we all tend to overembellish our body issues?) Anywhoo, never one to be against preventative measures, I've decided to give it a try. In clinical trials, when applied two times a day, reviewers using the entire line experienced a 41% more lifted appearance. Plus, the creme is packaged in 100% post recycled PET jar. Hello, lover!